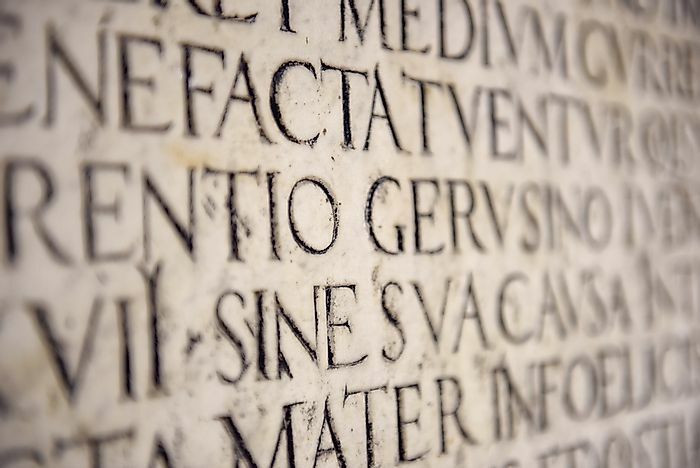 Although Latin once was the dominant language of the Roman Empire, it is spoken by few today. The Latin language can still be found inscribed on many buildings. Latin belongs to a group of languages referred to as the Italic languages. The Latin alphabet was developed from the old Italic alphabets which were derived from the Phoenician and Greek alphabets. The ancient Latin language emerged from the Latium region near the River Tiber during the period when Roman civilization was emerging. It is not clear how the Roman empire adopted the Latin language but since it was developed, the language has metamorphosed into several correlated forms. The old or early Latin language transformed to classical Latin which consisted of the Golden Age and the Silver Age. The Golden Age consisted of the period between 75 BC to AD 14. This period is considered as the peak of Latin literature. The first two centuries AD after the Golden Age is known as the Silver Age. The late Latin dated back to the period between 200 AD to about 900 AD and the period witnessed a resurgence in written roman languages. Vulgar Latin is used to describe the vernacular dialects of the early Latin which later transformed to other Roman languages that appeared in the 9th century. The Ecclesiastical Latin refers to the form of Latin used by the Roman Catholic Church. The Ecclesiastical Latin developed from the Late Latin and is not a specific form of the language but covers several languages promulgated at any time by the church. The new Latin also referred to as the Neo-Latin is the post post-medieval version of the language and is commonly used systematics and international scientific vocabulary. It became common among scientists and linguists toward the end of the late 19th century. The Catholic Church retains the use of the Latin language. It is considered to be one the official language of the Holy See. It is commonly used in state and organization mottos; Switzerland uses its Latin name "Helvetia” on its stamps, coins, and number plates. The European Union adopted the use of the Latin language in its mottos with the aim of promoting linguistic balance and avoiding linguistic compromise. The US Coast Guard is "Semper Paratus" which is translated to “always ready." The US Marine Corps' motto is "Semper Fidelis" which translates to "always faithful." Although Latin has always been the language used by the Roman Catholic Church, particularly Vatican, its use is on a decline and is considered among the threatened languages. Much of the language has evolved into Italic, Spanish, German, French, English, and Portuguese. In 2014, Pope Francis declared that Latin would not be used as the official language at the worldwide gathering of Catholic bishops, but instead Italian would be adopted. This brought an end to the use of the Latin language during the gatherings. Outside the Vatican, very few people speak the Latin language, and those who are able to cannot speak the original form of the language. Clergies use the language as a liturgical language while institutions across the globe, especially in Italy, are teaching the language in class in a bid to promote its use.